There has always been a need for high temperature aluminum surface treatments. To work successfully they need to be inorganic because at high temperature organic products will carbonize. But not all inorganic products will work either because chromates and tri-chromes form a gel called chemfilm. When these chemfilms are exposed to either high temperatures (heated above 150°F for any extended period of time) or left unpainted will start to dry out (mudcrack) and will not be able to be painted. SafeGard CC, a high temperature aluminum coating, is completely inorganic and the coating is a surface reaction not a hydrated gel coating, therefore it is the ideal high temperature aluminum surface treatment. What does that mean to you? SafeGard’s CC thermal stability is ideal for the high temperature cures that are used for many powder and paint coatings because it will not dry out and reduce the corrosion performance or paint adhesion of the pretreatment. This high temperature aluminum coating treatment passes the AAMA 603.8 requirements for detergent resistance (72 hr @ 100°F), boiling water, wet & dry adhesion tests. What does that mean to you? No paint coating failures due to better intercoat adhesion. Greater number of hour’s protection from salt spray and humidity. Less returns that will lead to more profits and repeat business. Another important feature of SafeGard CC aluminum surface treatments is that the product do not breakdown or emit toxic vapors or when heated. Therefore scrubbers will not be needed to purify the exhaust. Ovens - Heat is not required to set/cure conversion coating, but if heat is used nothing will be released into the environment. Thermally stable. What does that mean to you? You will have a more flexible operation, if you want to continue and paint today you can if you want to wait the product will still perform. Many coating require that they must be painted within 24 hours. This aluminum surface treatment reacts with the aluminum therefore it is not affected by out-gassing that often occurs when heating up aluminum castings. Sanchem offers many inorganic high temperature surface treatments for aluminum. SafeGard 4100 - Dry in place aluminum surface treatment to prevent aluminum corrosion and discoloration under humid conditions. Due to the fact that this aluminum surface treatment is not effected by heat it is often used in high temperature conditions up to 400-500°F. Also effective to prevent corrosion on in process aluminum parts and as aluminum can coating. SafeGard CC-3400 - You can get both the clear (15-20 seconds) and gold color (1.5 - 2.0 minutes) from the same tank. Provides excellent unpainted corrosion performance and creates excellent base for paints and powder coating applications. SafeGard CC-3500 - Gives you a gold-brown surface in 30-40 seconds. Provides excellent corrosion resistance and paint adhesion. This product is used extensively in powder coating applications. SafeGard CC-3000 - The NADC tested the best completely chromium -free metal surface treatment to the Mil-C-5541 specification. Their conclusion was that SafeGard CC is the best non chromate conversion coating terms of paint adhesion and corrosion resistance. SafeGard CC-6100 and SafeGard CC-7000 - Cold applied conversion coatings react in a few seconds to give gold-brown coating with excellent paint adhesion and corrosion resistance. Used for in service repair applications involving a small number of parts on a one time basis. How do I know if the pretreatment has been applied properly? SafeGard CC reacts chemically with the aluminum to give an easily identifiable gold-brown color. If the aluminum was not cleaned properly, no color change will occur. Unlike other pretreatments, you don't need paint failures to tell you the surface isn't properly treated. Is it thick enough? 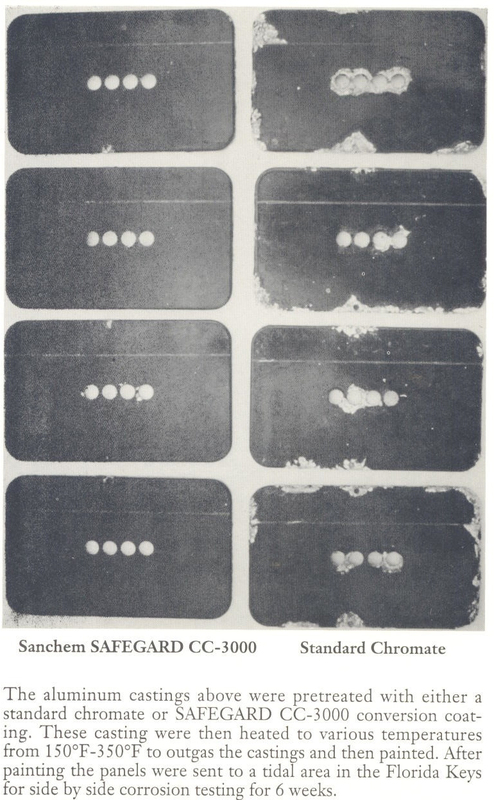 SafeGard CC only reacts long enough to give a coating thickness specific to the alloy you are working with. Other pretreatments have coating weights that vary with time and/or temperature. If their coatings weights are not in the proper range you will have paint adhesion problems. Is a pretreatment with paint adhesion and corrosion resistance necessary? Corrosion resistance prevents underfilm corrosion due to defects in the secondary coating which will end in paint failures. Can I leave pretreated aluminum in its unpainted form? SafeGard CC aluminum pretreatment provides excellent corrosion resistance without paint. Simple cleaning, or all other chrome-free pretreatment systems, leaves the metal open to corrosion. How difficult is it to maintain SafeGard CC treatment solutions? Other system require a complex series of pH and concentration adjustments. SafeGard CC is self indicating. A change in, or the absence of, the characteristic gold-brown color of the metal indicates that something is wrong with the system before you have a paint failure. Are there time restraints on painting after pretreatment? NO, you may paint right after pretreatment and drying or a year or more later. Will the process fit into my current equipment? In most cases, SafeGard CC will fit into your present spray line or dip line, with virtually, no modifications. Is there a color change on the surface when the surface is cleaned & pretreatment is properly applied? Yes, SafeGard CC 3400 and SafeGard CC-3500 react chemically with the aluminum to give an easily identifiable gold-brown color. If the aluminum was not cleaned properly, no color change will occur. Can I leave pretreated aluminum in its unpainted form? 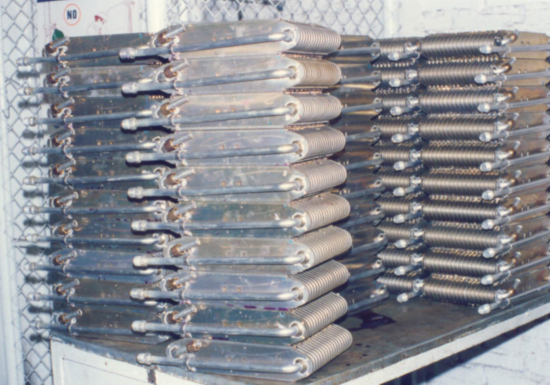 Yes, SafeGard CC pretreatment provides excellent corrosion resistance and does not require paint. How difficult is it to maintain SafeGard CC coating solutions? A simple titration or test kit is all you need. The long lasting stable process solutions have a wide concentration range. In addition the process is self-indicating. A change in, or absence of, the characteristic gold-brown color tells you something is out of control. SafeGard CC products are simple to mix and easy to maintain. SafeGard CC is your choice when paint adhesion and protection from corrosion are both required. We pretest your process needs so you will succeed the first set of tests. This saves you time money and you get success the first time. We don’t just sell you chemicals or products- Sanchem gives you high performance solutions that will give you peace of mind.